Hang Gliders have been around since Otto Lilienthal first flew one in the 1890's and were the original outlet for the dream of flying for the masses. They became very popular in the seventies once people had stopped using bamboo and string and started using aluminium tubing instead. Ironicaly it was the discovery that you could lose the tubes and just fly with the fabric (paragliders) that marked their downturn in popularity. 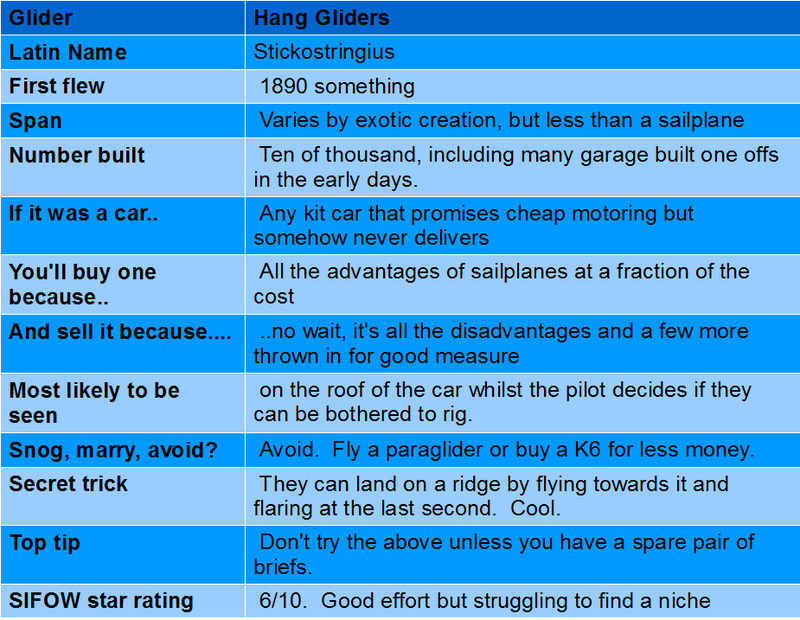 The modern hang glider is stuck between wanting to be a high performance PG and a low performance sailplane which has resulted in some exotic machinery which combines all the disadvantages of both. The main advantage of a hang glider over a paraglider is they don't collapse in the first bit of turbulent air they find, which is nice.